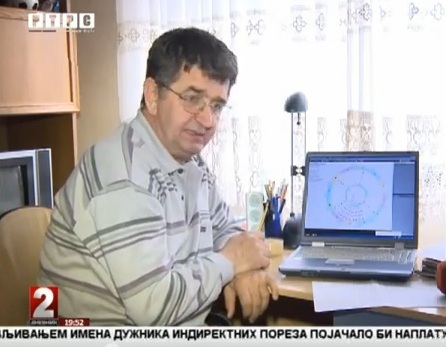 Last month just in time for the 20th anniversary of Republika Srpska, the main public broadcaster RTRS decided to broadcast in its evening news as one of the main stories the predictions of Gojko Mandić, astrologer by profession (his computer does give him some authority, but it does lack the magic). He warns that the state (the RS is meant) and the nation should not invest in risky financial transactions and number of other really promising predictions. This type of news does remind of the Milošević years in Serbia when the paranormal, the paranoid and the paramilitary worked hand in hand and nations got their horoscopes, cards read and other funnies. Some of these are still around, such as Treće Oko (current headline: why do aliens love Novi Sad? ), the Serbian equivalent of Weekly World News. 2013 is nothing short of stellar for you, Pisces. … Your powers of psychic perception and healing have never been stronger. Your ability to create glamour, weave fantastical illusion and provide invisible-but-potent healing to others is beyond measure. Others will feel inextricably drawn to you without understanding why. This is excellent for your star potential as others sense something extraordinary and sublime in your presence. People want to have you around as much as possible even without fully comprehending why. The best part is that people are willing to pay big bucks for whatever it is you have to offer and no matter how intangible it may seem. For once, you won’t feel like the oddball, freak or the perpetually misunderstood alien in the crowd but rather the mysterious-yet-sought-after special someone that others cannot resist. It’s all part of your otherworldly glamour and mystique. Work it, Pisces! … If you were planning on expanding your home or upgrading, now’s the time. … The eclipse points of 2013 will stir up your travel sectors — both domestic and foreign — so keep your passport and suitcase handy. This year is all about mind and soul expansion for you on every level. Get ready to leave the comfort of familiar territory for more experience and adventure than you’ve dared to dabble in for years. This year will be anything but ordinary. Montenegro is Cancer (13.7), as is Croatia (25.6.) so they’re having similar prospects. Get ready for a year of fabulous expansion, sweetness and love galore, Cancer. This summer, lucky Jupiter is moving into your constellation to bring amazing opportunity and expansion to your world — all the way into 2014! You’ve been preparing for the breakthrough and surge in success, so you’ll be more than ready to take your rightful place in the limelight. All areas of your life receive the benefits and blessings of Jupiter for the second half of 2013. Your confidence is sky high and you feel more optimistic about life and your future than you have in ages. All of the suffering, heaviness and loss of 2012 will quickly become a thing of the past as you embrace the amazing opportunities being showered upon you in 2013. 2012 had you face some very deep fears steeped in your childhood. Family issues and wounds from childhood were the challenges you had to face. It wasn’t easy but it brought a tremendous amount of inner strength in its wake. Rest assured, this new phase takes you out of the past and into the world of love, romance and creativity. You’re being asked to put considerable time into pursuing your heart’s desire — without exception. If you can structure time for what you love, your life will be infinitely more rewarding than it has been in years. The depression is definitely lifting and you are willing to embrace the sweet life once again. 2013 brings you sweeping change and intensity, Virgo. The biggest transformation takes place in the realm of the mind. Communication, correspondence and courses of new study carry great importance…. If you’re not already a powerful public speaker, teacher or writer, get ready to discover your latent potential to sway the masses with your power of speech! You’re also hungry for knowledge in 2013, and will want to strengthen your skill set and beef up your resume with even more knowledge than you possess naturally. The eclipse patterns stir up endings and new beginnings in relation to siblings, travel and legal issues. Siblings or close relatives could become a source of strain, and you’ll have to create firm boundaries. In fact, boundaries in all realms of communication will serve you to avoid overload. Your life is about to become ridiculously busy and filled with more people than you know what to do with. At the end of the day, you’re still a hermit at heart and need plenty of alone time, so be sure to carve that out regardless of how social your world becomes. Ok, I give up, there is no more need for political analysts, commentators and all the rest. Some good yahoo horoscopes do the trick much better and of course, there updates are plenty (daily, weekly, monthly). .